The device was presented in May and the unlocked, international version is available in the US from Amazon. There's no word on an official US release, but the rumor mill says AT&T might release it. The UK launch will happen this summer. 3 colors are now available: black, silver blue and gold. Lavender will be available in the UK. 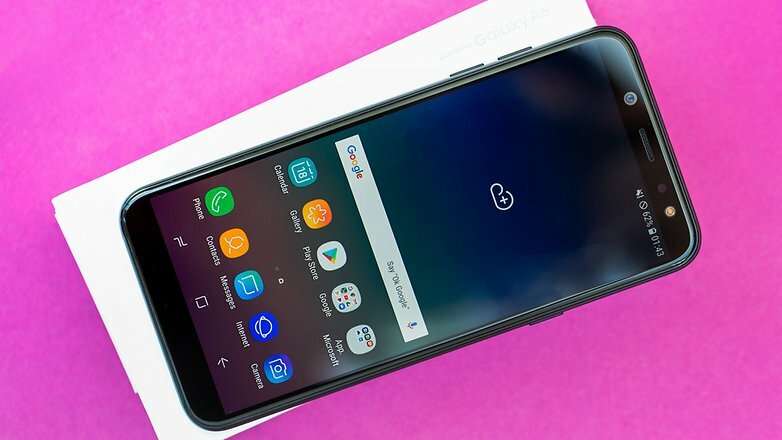 Visually, Samsung fans will quickly find their marks because this device takes on the well-known lines of the A series of 2018 . 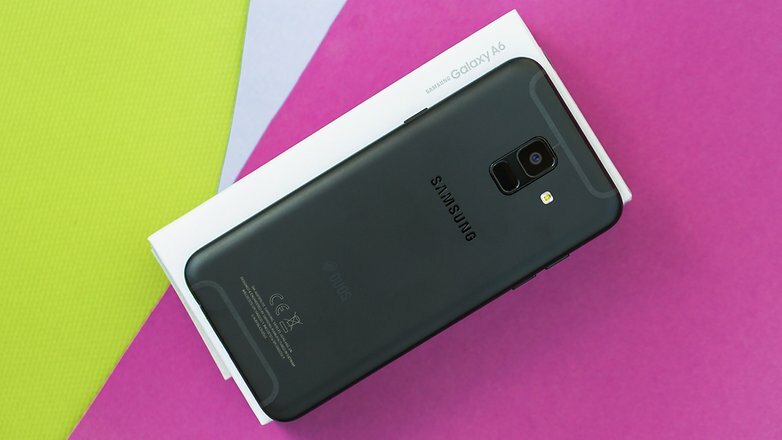 Its standard-bearer is undoubtedly the Galaxy A8 and we have to admit that the devices are very similar, despite their big price difference, at least at first sight because the A6 is far from being as well equipped as its big brother. At the front, we find more or less the same situation. With its 149.9 x 70.8 mm, the A6 has almost the same dimensions (the sizes of the bezels seem to be the same) but it's thinner at 7.7 mm. It is also lighter (159 grams). This is mainly due to the use of aluminium on the back of the device instead of glass. Above the screen, we can also see a difference in the arrangement of the sensors, as well as a deeper speaker grille. At the rear, we can see antenna lines above and below. It doesn't look awful, but it's not my taste. As for the layout of the fingerprint reader and camera, it's exactly the same as on the A8 (2018). The single rear camera has a fingerprint scanner underneath, all housed in a rectangular module with slightly rounded edges. In fact, the fingerprint reader is much faster than facial recognition. The headphone jack is of course present, and headphones are provided in the box (we will come back to this later). Unfortunately some elements are missing: Samsung doesn't give it USB Type-C or water resistance, which makes the A6 the ugly duckling of this year's A range. Can the rest turn it into a swan? It is obvious that Samsung cannot offer as high a level as it did with the A8, but release this as the pariah of the whole A range when even last year's models present better advantages seems rather strange. 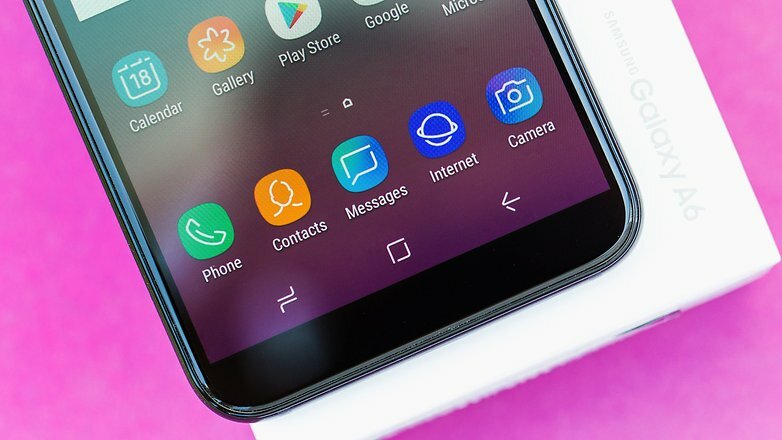 No surprise, we find a Super AMOLED screen (the Samsung classic). The A6 uses the same diagonal size as the A8 (2018), i.e. 5.6 inches, and also opts for the 18.5:9 format. On the other hand, due to the difference in level, the technical characteristics of the screen of this A6 are well below those of the A8 . The definition is HD+ (720 x 1480 pixels), which is in the end only an evolution of the HD we found last year on the A3. The pixel density is 294 dpi. In practice, the untrained eye will be satisfied with this screen, and it remains readable in most situations (even in the sun). However, users who are familiar with screen technologies will see that there are better AMOLED displays on the market. Anyway, you can configure it according to your preferences by choosing one of the different modes (which control the color range, saturation and sharpness). If you choose adaptive display (present by default) you can determine whether the colors should point to warmer or colder hues. In short, the screen that offers satisfactory performance but that could be better. 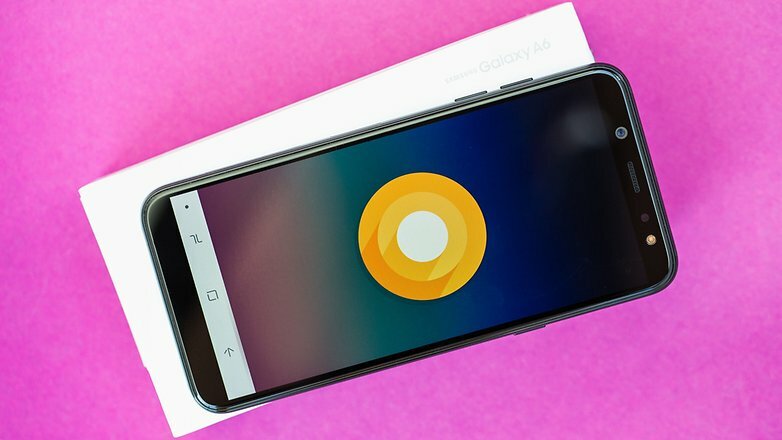 Samsung offers Android 8.0 Oreo and the latest version of its interface : Samsung Experience 9.0. It comes with its (small) batch of bloatware, i.e. some of its own apps (which cannot be deleted, of course), the classic Google apps as well as some Microsoft apps (Word, Excel, Powerpoint), and Facebook which cannot be uninstalled either. Visually, it's a very successful Experience, which is pretty and intuitive. What more could you ask for? A recent security patch. At the time of writing, the latest patch is from April 1st and it's now mid-July. One positive point (which will not interest everyone): an FM radio player is integrated and the headphones act as the antenna. The boundary between the A and J range hasn't been very clear since the Galaxy J7 (2017), J5 (2017) and A3 (2017) use the same SoC, the Exynos 7870. This SoC was created specifically for the mid-range to match up against the Snapdragon 625, and it has to live up to the new "premium mid-range" that is becoming so popular. It is produced with a 14 nm process, and is supposed to ensure appropriate battery life: an improvement compared to the previous model (7580) which was produced with the 28 nm process, and its octacore Cortex A53 is supposed to ensure a maximum speed of 1.6 GHz. Its GPU chip is also familiar, as we find it on the Galaxy J7 and on the Honor 9 Lite. How does it hold up in practice though? In everyday life, there's smooth smartphone in most situations, but it is obvious that it tires a little bit when it is subjected to stress. The 3 GB of RAM makes it possible to have rather fast multitasking, and its 32 GB eMMC does not pose any problem. On the other hand, don't expect to run resource-hogging games, because the smartphone will slow down quickly. That's no problem for Ping Pong King, but PUBG will quickly become an issue. When it comes to benchmarks, the SoC quickly showed its limits. The only speaker is located above the screen, on the edge of the unit (just above the power button). It sounds decent, and achieves high volumes, though there's a lack of bass. Unfortunately, we can't say the same about the headphones that come in the box. If you are in a quiet environment, they're fine, but in a place like the subway, you will have crank up the music very loud to be able to hear something. Note that Dolby Atmos sound is available when using headphones. There's no particular problem with having telephone conversations, although better handling of ambient noise would have been appreciated. Sometimes the microphone didn't pick up my voice very well. This year's A6 has the same camera setup as the A8 (2018). We find a 16 megapixel sensor on the front and at the back, and in both cases with an LED flash. The aperture is better at the back though since it's f/1.7, and at the front it's f/1.9. When the lighting is good, the camera takes successful shots but sometimes has a slight tendency toward unnatural colors, which can sometimes be quite annoying if you want to capture the beauty of an object/scene precisely for its colors, like a sunset or flowers. The absence of automatic HDR mode is unfortunate, but it is only a tap to do on the phone, which you'll get used to very quickly. In any case, if you want to avoid seeing some colors encroaching on others you will have to use HDR. Surprisingly, the detail reproduction is good. Poor lighting conditions are usually a problem for smartphones and the A6 (2018) is no exception, though it doesn't do too badly in the end. In short, the shots you get are what you'd expect: not bad, not great. Samsung has added a feature which it calls "Stickers", i.e. using artificial intelligence to add rabbit ears, etc. These filters work equally well on the front and rear cameras. It's fun, but do they deserve to be used more than once? That's a matter of personal taste. The front camera also takes reasonably good selfies. It has a portrait mode that does a good job when it works, but sometimes you have to do it several times, which can be a pain if you want to do selfies in the moment. If you want a little more control, you can use the Pro mode, which allows you to adjust white balance, ISO and exposure. With a battery of 3,000 mAh for a 5.6-inch display, this device has a nice advantage if it manages to optimize the software. It does pretty well: energy consumption is rather moderate as long as you don't ask too much of it, like launching a game with intense graphics. In practice, you can get a day of battery life easily . If you forsake games and videos, you can even reach two days between charges. The bad news is that the device charges very slowly for a time when we are used to seeing fast charging everywhere, especially in this price range or for even less, as the Moto G6 and its TurboPower charging demonstrates. Admittedly, the A3 didn't have fast charging, but the A5 did, so we should have been able to expect it on the A6 as well. 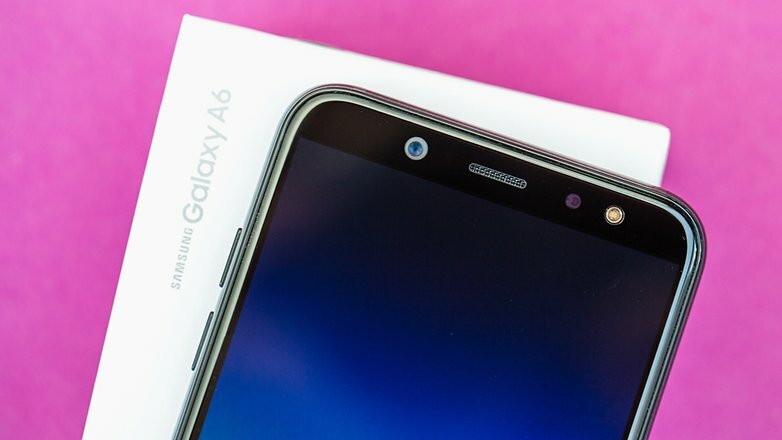 The Samsung Galaxy A6 (2018) is the ugly duckling of the A series, which would have been a swan in the J series. Technically speaking, it's more similar to the top of the J range and it lacks the things we would normally expect in the A range, like water resistance. It's far from a total dud, though. It handle normal tasks without issue, and it even manages to pleasantly surprise with its photos in some cases. It also has its other merits, like Dolby Atmos sound and good battery life. Unfortunately for Samsung, the competition is fierce. At this price point, or for even less, you can get a well-equipped Moto G6 or Honor 7X, which many will find more compelling.